There is a new button in the action bar on all tabular standard reports in Analytics, labeled "Customize". Clicking this button loads the custom report builder. From there, you are just clicks away from your own custom report. New metrics, familiar reports - The best metrics are the ones that provide actionable insights into your business. 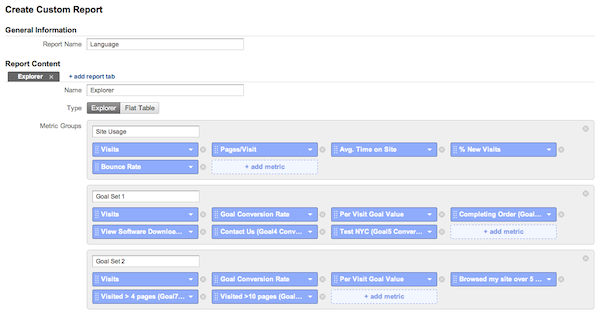 Try adding different metric groups to your favorite reports to see if how it impacts your view of conversion rates. Drill down into your data - Sometimes, the best route to a particular piece of data is a drilldown not found in any standard report. You could customize the Language report to drill into search terms for a language-by-language comparison of your organic search traffic. 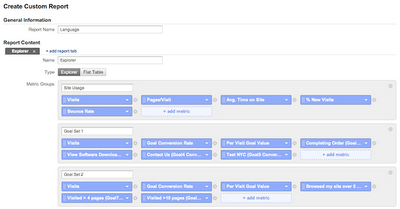 Filter to find insights - Ad campaigns can span many networks. Try customizing the AdWords Campaigns report and applying a filter for Ad Distribution Network matches "Google Search" to see your performance on only Google Search. Not all standard reports can be transformed into custom reports. Look for the "Customize" button to see if a particular report can be customized. Learn more about Customizing Standard Reports in our Help Center. We hope you'll gain even greater insights into your data by customizing the power of Google Analytics standard reports to more closely match your business needs. Designing a good custom report can be challenging, and sometimes all you really want is a slightly different version of a standard report. Using the new "Customize" feature in Google Analytics allows you to tweak our definitions of Standard Reports into your own Custom Reports.